FORT WORTH, Texas – The GOP held its statewide convention here June 6-8 in the only major city they can still carry in statewide elections. It was the largest almost-all-white political gathering of its size in recent times. 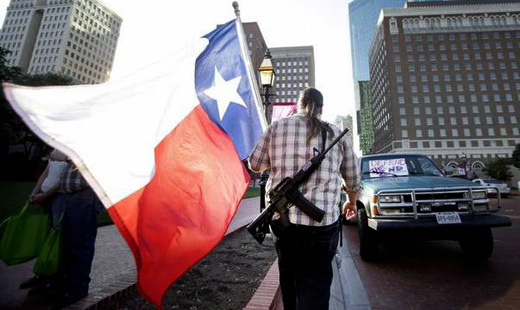 Advocates of “open-carry” rallied outside with AR-15 assault rifles. Inside, more reactionary events occurred. 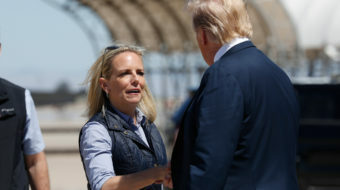 According to press reports, the Republicans compared immigrants to terrorists in that they should not be negotiated with at all. No path to citizenship, which they call “amnesty,” should be allowed. 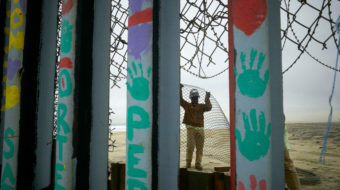 Instead, the state should fence off the 1,500-mile border with Mexico. They want to end the in-state college tuition rates for which the children of undocumented immigrants are now eligible and they want Texas police to be allowed to question the citizenship of anyone. Gays, according to the Republicans, have voluntarily chosen their sexual orientation and should be encouraged by the state to take “reparative therapy” deprogramming to become heterosexuals. The Log Cabin Republicans, a gay organization supporting Republicans, was banned from having a booth. According to the Texas GOP, home schooling should be encouraged and reduction of funding for all public schooling should continue. Regressive property taxes should be abolished in favor of even-more-regressive sales taxes. The state lottery benefiting education should be abolished. A number of federal agencies should be abolished, including the Environmental Protection Agency, the Department of Education, and the Federal Reserve. Governor Rick Perry, who used to be considered the most rabid reactionary in the nation, came in fourth in the straw poll for presidential nominees. He was beaten by libertarian Senator Rand Paul, Dr Ben Carson of Maryland, and the top vote getter: Texas Sen. Ted Cruz.